We’ve come a long way, you and us. From our very first ride all the way back in 2012, we’ve journeyed more than 21,065,336,859km together. What’s it they say about “loving you to the moon and back”? With that mileage, we could have gone to the moon and back together 27,400 times! We’ve taken you to your first dates, and rode with you to the weddings of your children. For seven years, we’ve journeyed alongside each other, and along the way, we’ve made some great memories. Remember all the times you found love through a Grab ride? And how will we ever forget the 21 of you who gave birth to babies on these trips! We’ve also celebrated some big milestones together. 1 billion rides in October 2017. 2 billion rides nine months later. 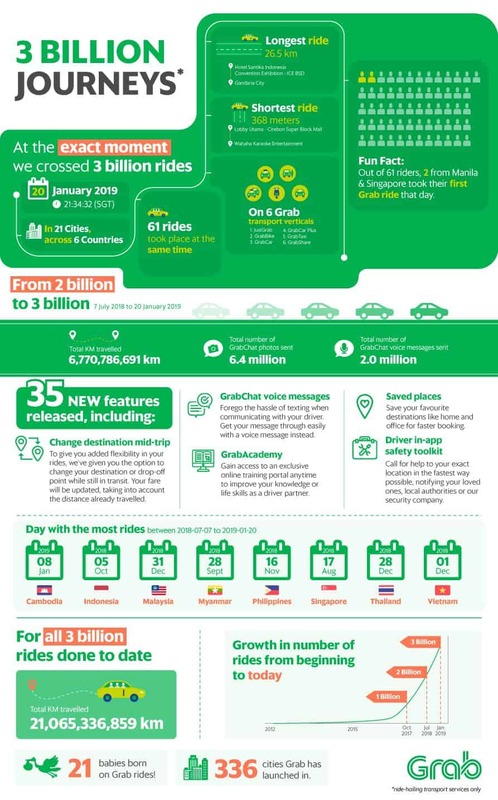 And then just six months on, at precisely 21:34:32 (SGT) on Sunday, January 20, 2019, we hit 3 billion rides (ride-hailing transport services only). When we crossed the 3 billion mark, it was with 61 trips starting at the exact same time, taking place across 21 cities in 6 countries. The shortest of these journeys had a destination just 368m away (it was raining heavily in Cirebon that night, so we totally get it! ), while the longest was a 26.5km ride in Jakarta. Shawn, a Junior College student from Singapore was taking his very first Grab ride when he also became one of our 3 billionth riders. He was heading home after a game of badminton and while he would normally have taken public transport, decided to book a taxi through Grab as it was late. Joining him at that 3 billionth moment were passengers who had been riding with Grab since all the way back in 2014 (from Kuala Lumpur! ), as well as driver-partners that have been with us from as early as 2015 (hailing from Manila! ), to as recently as 16 January 2019 (all the way from Bali!) – just 4 days before the milestone. But while Shawn’s ride and the 60 others may have the special honour of sitting at our 3 billion mark, it’s not only theirs, but every ride that has happened before then and that will come after, that mean the world to us. Everytime you book a ride with us, order a meal with us, or get a parcel delivered with us, we know you’re choosing to put your trust in us. To get yourself or what you need from point A to B in a safe, comfortable and reliable manner. We don’t always get things right. But there’s nothing we hold more sacred than your trust, and no bigger priority for us than to keep improving our services for you. To be #BetterEveryday. As we look ahead at the 4, 5 or 10 billion milestones to come, we know that we’ll get there, with you, making a lot more memories together along the way. For more milestones and fun facts from our 3 billion journeys together, check out the infographic below!